I got this dress awhile ago and I have been saving it to wear for Thanksgiving. I recently found these floral lace tights and I love them! Because the cold weather sticks around for so long in MI I am always looking for fun tights to add to my collection. I definitely will not be wearing dresses or skirts without tights for quite awhile! As you can see from the pictures it was a cold windy day on Thanksgiving, so I added the faux fur vest for extra warmth (and because you can never have too much faux fur in an outfit). For those of you that don't have the time or patience to make turkey cookies like the ones pictured I have you covered! I wanted to share a few very easy holiday treats if you are interested in making something semi-homemade. The pretzel kisses are one of my favorite treats, and they are SO easy to make! All you have to do is line a cookie tray with mini pretzels and place an unwrapped Hersey kiss on top of each pretzel. Put them in the oven for about 5 minutes at 175 degrees. You can use any kind of kiss-just watch closely while they are in the oven because all chocolate melted differently. Right when you take them out of the oven put an M&M on top and you're done! Let them cool and enjoy! All you need for these are round sugar cookies (I use homemade but you could also use store bought or already made dough). To decorate you need candy corn, mini M&Ms, and vanilla frosting that you can dye orange. Simply use some of the frosting to attach the candy corn and M&Ms and then pipe on the beak and feet and you're done! I have made these every year for quite awhile and they are always a hit! 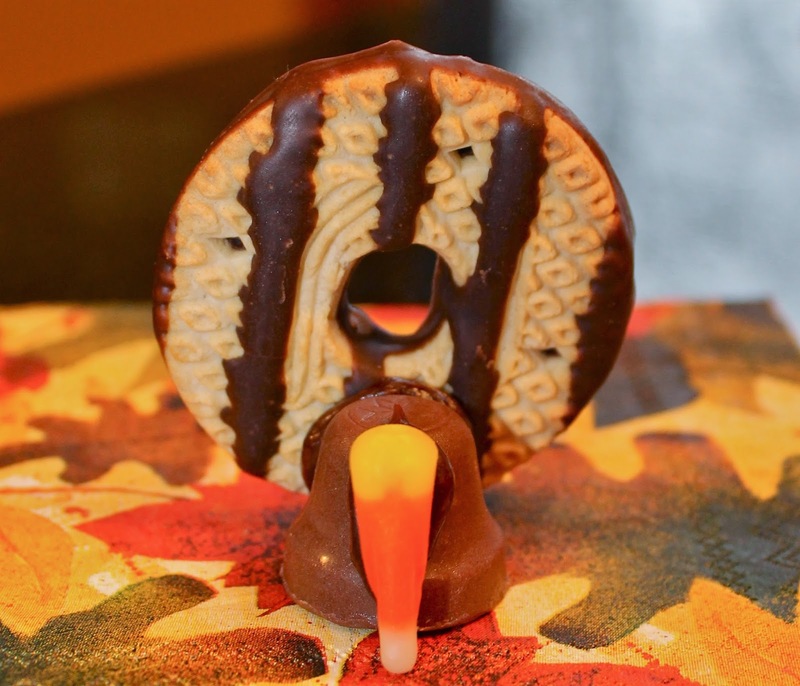 All you need are Fudge Stripe cookies, candy corn, chocolate frosting, and Reese's bells (out for the holidays). You simply use chocolate frosting (homemade or store bought) and attach the three pieces. Let them dry flat, you can even put them in the refrigerator . When you take them out of the refrigerator to serve you can stand them up. They are easy and adorable! I love Thanksgiving. I love getting together with family and enjoying delicious food and remembering all I have to be thankful for. I am so thankful for my friends, family, and my fiancé (it still feels weird to say!). I am so grateful for all the wonderful people in my life and I can't wait to see what this year has in store. Hope you all had a great Thanksgiving! Now it's time to enjoy Black Friday shopping! Thanks for reading!